Home / Unlabelled / Is Seattle Ready for Snow? Is Seattle Ready for Snow? - Hi, friend Climate and Weather Information, in this article entitled Is Seattle Ready for Snow?, we have prepared this article well and concise to be easy to understand for you to read and can be taken inside information. hopefully the contents of the post that we write this you can understand and useful. okay, happy reading. During the past few days there has been a great deal of media attention regarding Seattle's updated plans for dealing with lowland snow in the city. At a recent press conference, a comprehensive city response plan was discussed and the Mayor made it clear that the city had taken wide-ranging steps to be prepared. This whole discussion is very timely considering the latest weather forecasts for later next week--the atmosphere is moving towards a La Nina-like pattern with ridging in the eastern Pacific and cold air plummeting southward. (Don't get too excited yet---most of the time cold and snow forecasts more than a week out don't materialize for reasons I can discuss in another blog). But I am sure Jim Forman of King-5 is waterproofing his famous ski parka. Last month I was invited to talk to the Mayor's staff and some of the department heads (as well as Metro staff) about the potential for snow this winter. Let me tell you, these folks are serious about dealing with snow and preventing a repeat of the disaster of December 2008. And their newly released snowstorm plans are impressive in many ways and many of the mistakes of 2008 will not be repeated. First, they will aggressively pre-treat roadways BEFORE the snow hits so it will not bond to the pavement. They will use salt on roadways after snow falls to encourage melting. They will plow the snow to the sides instead of into the center of streets (snow in the middle of the streets creates major barriers preventing turns, the snow melts and then refreezes as ice in the traffic lanes, and many other bad things). No more packing the snow down and sprinkling some sand on it. They are going to coordinate with METRO to get the buses off streets on which they will only get stuck. They are going to triage the roadways, as noted in their snow map below. They are making it clear that only main routes will get treated and plowed. This makes sense--with limited resources you have to use what you have to open the city rapidly to buses and commercial traffic. Then, with main roads clear and the main bus routes running you take on the side streets. Clearly, Seattle must triage since they have only 30 snowplows, which is not nearly enough to clear a city this size--so SDOT has to work smart. (FYI--Denver has 68 plows but they get nearly 60 inches of snow a year, roughly 6 times more than we do, but we have more of an ice problem). So we are in a much better place than two years ago and Mayor McGinn and City of Seattle staff are highly motivated and working hard to be prepared. But let me provide some suggestions considering the meteorology of Seattle snow events. Seattle snow generally falls on relatively warm ground that initially melts the snow into slush before it refreezes. That is why we frequently have an ice problem after snow events. You have to plow it off rapidly before it freezes, and if you can't do that you need to pretreat to stop it from bonding to the concrete so when it does freezes you can scrape it off. And you need to get salt on top of any frozen roadways to encourage melting. So rapid response is key. And so is getting the vulnerable buses off the roads...particularly the trolley buses and the double buses, both of which are disasters in snow. Now the city has 30 plows. Lets say that 25 are available at any one time (which would be very good I would think). And lets assume that they plow at 20 mph. So they could cover at best roughly 500 miles of roadway an hour. How many miles of roadway lanes are included in the routes outlined in the map...my rough estimate is 1200 lane miles. So it would take 2.5 hours to cover the city--and that is optimistic. If the snowfall is relatively light (.5-1 inch an hour) this might be ok, but if the snow is heavy (several inches per hour) there is going to be trouble. My suggestion: have a smaller core set of major streets that get priority in heavy snow. Get those clear, keep them clear, and steer the buses to those streets. If snow is forecast and some people absolutely need their cars, they might be encouraged to move them to major parking lots near major streets and bus routes...like those at Magnuson Park, Northgate Mall, the UW, etc. Now a major worry is Metro bus service. As noted above, the trolley buses need to be pulled at the first sign of snow (they skid, move off the overhead lines, and are like dead whales) as should the articulated (double) buses that jackknife on snowy hills. 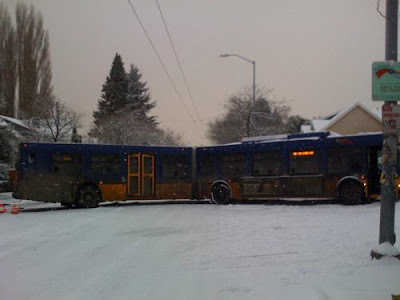 Let SDOT clear the roads to bare pavement and then those buses can be used. Core, protected snow routes, need to be established (I think they are going to do this). And service needs to be increased above normal frequency on those routes. People might have to walk a bit, but they will be able to get home. Now a sore point for me is Metro's bustracker software. This should be a critical element for snow situations, allowing people to see where the buses are (and aren't). In December 2008 the Metro bus tracking site completely failed under the load of potential bus riders. They have made some moderate upgrades (roughly three times the capacity), but those will probably not be enough, particularly now that many people have internet on mobile devices. Getting a properly size server would not be that expensive and should have been more of a priority. The other problem is the ancient bus tracker technology Metro is using. Instead of using GPS, which is modern and now inexpensive, they are using an old fashioned radio system that is not only undependable, but which is guaranteed to give poor results when the buses go off their normal routes. Metro knew they had this deficiency two years ago and haven't dealt with it. These days, accurate positioning of buses is essential and is desperately needed in snow situations. Finally, there is an important element of personal responsibility. Moving your car down the hill is one. Having a snow shovel and some salt/deicer is another. Some neighborhoods (like mine) are planning to have a large supply of deicer to take on the worse street sections in our area. Sort of like the snow version of the block watch program. Anyway, a great American city was unnecessarily crippled during the December 2008 due to poor planning and operations. To be fair, that event was unusually prolonged...but such events do happen here every decade or so (e.g., Nov 1985). The city seems far better positioned today to deal with snow. And parenthetically snow forecasting has never been better. But keep in mind that forecasting snow is the most difficult local prediction problem. Why? Because we have to get BOTH temperature and precipitation right? Because we have to get the AMOUNT of precipitation right. And because our area is often right on the edge between rain and snow. The Olympics of forecasting! Thank You and Good article Is Seattle Ready for Snow? this time, hopefully can benefit for you all. see you in other article postings.